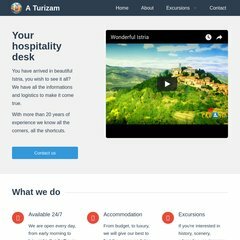 Topics: Accommodation, Apartments, Rooms, Houses, Istra Guide, and Destinations. a-turizam.hr NP Brijuni - Brijuni (Brioni) consists of more than twelve ..
On average 5.00 pages are viewed each, by the estimated 12 daily visitors. It is written for PHP/5.2.13 language. Its 2 nameservers are ns1.server-026.com, and ns2.server-026.com. Theplanet.com Internet Services Inc (Texas, Houston) is the location of the SC server. PING (74.53.88.180) 56(84) bytes of data.